I had no idea that St. Petersburg City Councilwoman Leslie Curran was a cyclist. 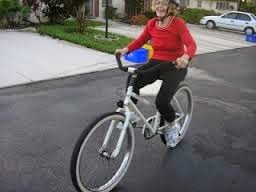 Unfortunately, I found out today she liked to ride a bicycle when I read two stories about a nasty bike crash she suffered this morning in the St. Pete neighborhood of Lakewood Estates. She was placed in a chemically-induced coma suffering from a head injury believed to be a concussion. She was wearing a helmet. Leslie was drafting her friend who was ahead of her. Police are trying to determine if a third bicyclist who joined them during the ride played any part in the crash. The third cyclist also fell when he struck Leslie who had already crashed. Police are trying to find the third cyclist to discuss the bike crash. The third cyclist suffered road rash and biked away with paramedics not getting his name. The St. Pete Times story says Leslie was riding with her friend on an early-morning 18-mile ride when a third cyclist joined. And here's the Tampa Trib story. Her bike crash came a few days after St. Pete Police cracked down on bicyclists for not stopping at stop signs in response to Mayor Bill Foster's orders. Since the Pinellas Trail was discussed here, I thought I'd point out that the majority of unsignalized intersections along the Pinellas Trail have traffic control designs that are incorrect per the national guidelines on how these intersect...ions should be signed. In many cases, the trail should be given the right-of-way instead of the road that it is crossing. In other cases, yield signs are appropriate instead of the stop signs that have been used. It would be interesting if someone ticketed at one of these intersections used this as an opportunity to show that the intersection is improperly designed - this is potentially a way to have the ticket dismissed. Enforcing the exact letter of the law in every case doesn't make sense. For example, it doesn't make sense to ticket the single cyclist... who was ticketed after rolling slowly through a stop sign when presumably there was no one she needed to yield to. However, when a cyclist (or group of cyclists) goes through a stop sign when there are vehicles already there who should be given the right of way, this should be enforced. In most areas of the country that I've ridden in, cyclists behave appropriately, yielding when necessary, but not necessarily coming to a complete stop. In St. Pete, many of the group rides often don't treat stop signs appropriately - riders roll through even when other vehicles or pedestrians are already in or near the intersection and should be yielded to. I've nearly been rear-ended by cyclists in groups in St. Pete because I tend to take a more conservative approach to stop signs than many of the riders there. Ironically, the behavior that I describe above is probably one of the big reasons why St. Pete is cracking - if group ride behavior in St. Pete was better, this likely never would have become an issue. Personally, I'm fine with the police enforcing the law when groups treat stop signs inappropriately as I describe above. However, clearly, the Police in this case are taking it too far. The vast majority of drivers (whether driving a car or a bike) roll through stop signs when there is no one to yield to; they do this in particular when these stop signs are unwarranted by the standards that we traffic engineers use. Strictly enforcing this law solely on bicyclists simply doesn't make sense. Just in case you're curious, Euclid Avenue in Tampa is getting fitted with signs that explain that bicyclists can have the lane after Mayor Iorio killed an original plan for bike lanes for the 2.2-mile stretch from Bayshore to Westshore. With the signs up the sharrows are supposed to come next. Here's the first sign on Euclid right off Bayshore. Not sure you can see this bicycle sign all too well. 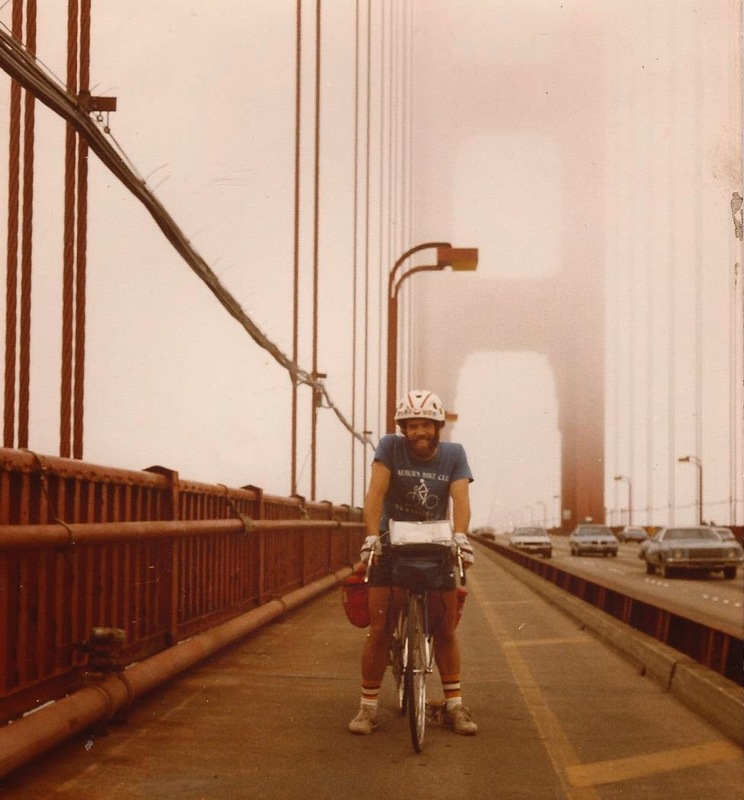 I have lived all around the country and biked all around the country. And I found the places that embrace bicycling -- offering space on the roads for cyclists; trails for casual cyclists and convenient parking for bicycles -- are the places that are economically vibrant. It's a good investment to create infrastructure for bicyclists and to be nice to bicyclists. But some places single out bicyclists to give them tickets. In Pasco County, sheriff's deputies specifically stalked bicyclists at rural intersections. And St. Pete Police handed out $166 tickets at stop signs a few days ago. Sixteen cyclists felt the pinch. And I hear from Sandy that 20 cyclists in San Antonio today got stung with parking tickets for parking on the grass off the road because the parking lot was packed. I'm not condoning bicyclists who are lawless. But cyclists are already marginalized. We're on high alert to stay safe and alive from careless and distracted motorists. It just doesn't seem like a good use of public resources for police to single out bicyclists when cars roll through stops and rarely come to a full stop when making a right turn on a red light. Two from the St. Pete area have written St. Pete Mayor Bill Foster, who was quoted in a St. Pete Times story on the crackdown on bicyclists as saying cars and bicycles don't mix. That's s strange comment since St. Pete under previous Mayor Rick Baker developed a great bike program to do just that -- develop roads where bicycles and cars can safely mix. I do not wish for anymore of my tax payer dollars to be spent on frivolous things such as sting operations to ambush and ticket bicyclists when there are ...crimes still unsolved in this city such as home invasions, burglaries, murders, child abductions and pedophilia. I would also like to see a balancing out of law enforcement in this city. In that, when a bicyclist makes a phone call to the police department to report a motorist having passed them too closely (3 ft. law), they should not be told by the police dispatcher that there is nothing they can do about it. They should not be discouraged from making a police report and when a complaint is made to the police department concerning a PSTA bus almost running them down inside the bicycle lane, they should not be told to hang up and call PSTA and that there is nothing that can be done about it. I call this passing the buck. Law enforcement is supposed to protect the rights of all of its citizens and not solely one particular group of people, regardless of the amount of phone calls or e-mails that are received concerning one party or the other. If the city expects to be viewed as a sports venue, vibrant and full of health-minded people, then catering to solely the motoring public will have a very negative effect on this image. Recently it has become an issue of yours and the Police Department to start targeting bicyclists who so much as even roll through a stop sign, even if there are no other vehicles at the intersection..., or they make it there first ahead of a motorist. Certainly the law is at a STOP sign vehicles are to stop. You and I know this does not happen whether it's a car, truck, van or bicycle. Honestly, who among the population has stopped completely at every single stop sign every single time under every single circumstance, every single day? The citizens who ride and drive on our roadways do a pretty good job of policing themselves in situations like this. Without a doubt there are those from both sides of the equation who blow the practice of this theory right out the window. The practicality of the law, as it pertains to bicyclists, is not the same as it is for an automobile. Many times a motorist will even wave the cyclist through ahead of them after making eye contact. This falls into the category of SHARE THE ROAD which is posted everywhere. Under your recent "crack down" this waving the cyclists through is an invitation for a ticket to the cyclist. Absolutely there are those cyclists who believe they can do whatever they want whenever or wherever they are. (Motorists are no different.) This endangers themselves, the group of bicyclists that are following them, and the motorists, and understandably so should be singled out. St. Petersburg has made great advances in being one of the better cycle friendly cities, and that's not easy or done by simple chance. There is also the case of the 3 FOOT LAW for motorists around bicycles. This law is not enforced, upheld, or even taken serious by our Police Department as a cyclist rolling through a STOP sign in a safe manner is. City buses buzz cyclists so close you would think your number is up. Yahoo's think it's funny to come up on cyclists and blare their horn to get a startled reaction from them just for kicks, while others literally run cyclists off the road or cut in front of them while texting and almost taking their life out, or in some cases, actually do kill the cyclist. But no protection or "task force" is put out to target this type of automobile behavior. Why is that Mr. Mayor? Not an easy enough target to investigate and cite for a traffic infraction that can often times be deadly? Or is it deemed bad cyclists are a nuisance and motorists are not, so they all need to be punished and put under a daring watchful eye? I challenge you to join in on a bicycle ride of even 10 miles through the city on a few occasions and see firsthand just where the lions share of the blame for dangerous encounters really is. Why is it that cyclists try to keep upright and cruise, cautiously, through an intersection while being keenly aware of every automobile that is close enough to kill them with a flick of the ankle on the gas pedal? Convenience you might say. Okay, sometimes, yes that happens. But many times it's actually a fact of slowing or impeding traffic for the cyclist to make that complete stop, where if the cyclists had proceeded with caution and eye contact with the motorist traffic keeps flowing for all. Some motorists who complain think there should be NO BICYCLES ON THE ROAD period. It is legal in all 50 states for bicycles to use the roads as a vehicle, and yes, follow the same rules. Some of those rules work best with a little leeway for discretion. Where there is a problem, and to only listen to one side, or target only one side of the equation does not correct the problem. It only unfairly targets one side while ignoring the other. Oh by the way, there is a litter law in every city of the United States. From the looks of things - that isn't convenient to enforce either. Interesting story in my hometown newspaper about a former motocross track biker switching to bicycling after knee surgery. St. Pete Police are issuing tickets to the local roadies for not coming to full stops at stop signs. Sounds like the scene in Pasco County. The Tampa Tribune did a story today on the ghost bike memorializing the life of Admiral LeRoy Collins, killed while riding a bicycle in Tampa July 29. 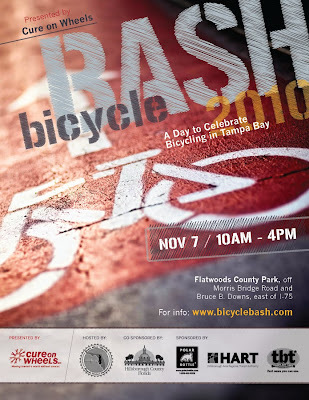 Thank you Doreen for a terrific 2010 Bicycle Bash poster. 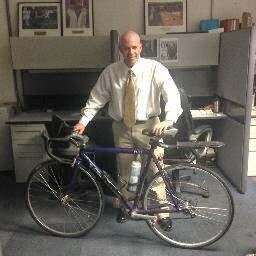 Joe Mizereck of Tallahassee, who sells a yellow bike jersey with a 3-foot message and arrow for motorists to see, posts this story about Greensboro, NC trying to improve bicycling safety after cyclists were killed. Look, most motorists and cyclists get along very well together on our roads (and they are OUR roads). However, we have a lot of work to do to address the problems caused by the irresponsible and disrespecful scofflaws on both sides. So much of the noise surrounding cycling safety issues are focused on the actions of the few motorists and cyclists who just don't get it...those few who don't care about their own safety let alone others' safety. We argue endlessly about the actions of these few scofflaws on both sides. And while we argue people are getting hurt and killed. Moms and dads and brothers and sisters and just good people are losing their lives because we cannot get it right. We cannot focus our attention on taking reasonable steps to provide "clear standards for behavior and ultimately safer roads for drivers, runners, cyclists, pedestrians and all others." We have to push aside all the meaningless noise and do whatever we can to give vulnerable road users greater protection in our car centric society. And at the same time we need to let vulnerable road users know that they have rules to follow as well...and they too will be held accountable. Authorities must address the violation of the laws by all road users. Indeed, changing motorist behavior will save lives, but it is also important to understand that changing cyclist behavior is where we can make the greatest impact on cyclist safety because cyclists, not motorists have a very strong personal interest in modifying their behavior to be visible and predicable…the keys to safe cycling. Bottom line, cyclists can solve a majority of their own problems by riding visibly, predictably and responsibly. Good luck Greensboro...lives are at stake. Saturday morning's bike ride took us to that famous roadside attraction on Davis Islands -- the Jeter Compound construction site. Bay News 9 reporter Jody Lowery did a terrific news report on ghost bikes. This weekend, Ed Collins will be featured in a Bay News 9 TV report about his dad, killed in Tampa while riding a bicycle on July 29. He also spoke with Bicycle Stories. Here is the short interview. SWFBUD store Just Ride Bicycles reminds people that a flat repair class is set for 6:30 PM Monday. There is space if you would like to learn how to change a flat. It's a free class. Owner David Luppino will also cover general maintenance and cleaning as well as answer questions. Please call or email if you plan to attend. Just Ride Bicycles is at 13431 Boyette Rd, Riverview -- 813-381-3907. Time to share some photos from Colorado on a recent visit. There are ghost bikes across the country. This one was on the road from Denver to Golden about three miles from Golden. The bicycle scene is amazing in Denver and Colorado. All types of characters. Like this fella on a unicycle pedaling up Lookout Mountain Road from Golden to Buffalo Bill's Grave -- a climb of about five miles or so. The bike path along Interstate 70 a few miles from Idaho Springs. Amazing stuff. The bicycle ride up to Mount Evans on North America's highest ride is an amazing journey of pedaling above the clouds and viewing some of the most spectacular alpine landscape on the continent. Elevation: More than 14,000 feet. Some guy tweeted that he was coming to Denver the next day to announce a seven-stage pro race that would start in August 2011 in Colorado. His name was Lance Armstrong and he made the announcement on the steps of the Colorado capitol in downtown Denver. Lance then led a bike ride to a local park. And the 3,000 bicyclists who showed up in the middle of the day in the middle of the week went along for the ride. The regional trail system is astounding. I did a 55-mile ride with six friends connecting with four or five different trails through three counties. Rocky Mountain National Park is one of the iconic parks in the U.S. Trail Ridge Road is an amazing road to bike into the alpine terrain and above. Some assorted photos. Maybe you heard this fella -- Buffalo Bill. Say it ain't so -- the electric horse at the Buffalo Bill Museum was broken. Not like I was going to try and ride it. My old newspaper beat -- covering city hall in Denver. Denver Art Museum -- amazing. Red Rocks Park outside Denver. There is open space everywhere in metro Denver. Lock your bike up in style in downtown Golden. Stop the lip service and start helping bicyclists. I don't want to hear about another bicyclist who is killed in Tampa. At 1 pm today, Ed Collins met a Bay News 9 TV reporter at the site of where his dad, LeRoy, was killed while riding his bicycle on July 29. There is a ghost bike at the corner of Brorein Street and Hyde Park Avenue, memorializing the loss of a bicyclist's life. Mr. Collins will always be remembered. 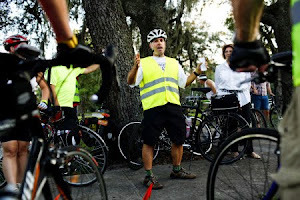 I am so proud to be a friend of Ed, who in the aftermath of his dad's death has spoken out for bicyclist safety and for the city of Tampa to start taking real action by installing bike lanes, sharrows, bike signs and a public safety campaign to advise drivers to look out for cyclists. More and more people are riding bicycles in the Tampa Bay area and the country's top transportation official declared that cities and counties must plan for bicyclists and pedestrians -- not only cars -- when it comes to designing and building roads. For years, Tampa built roads without bicyclists and peds in mind. The jig is up. 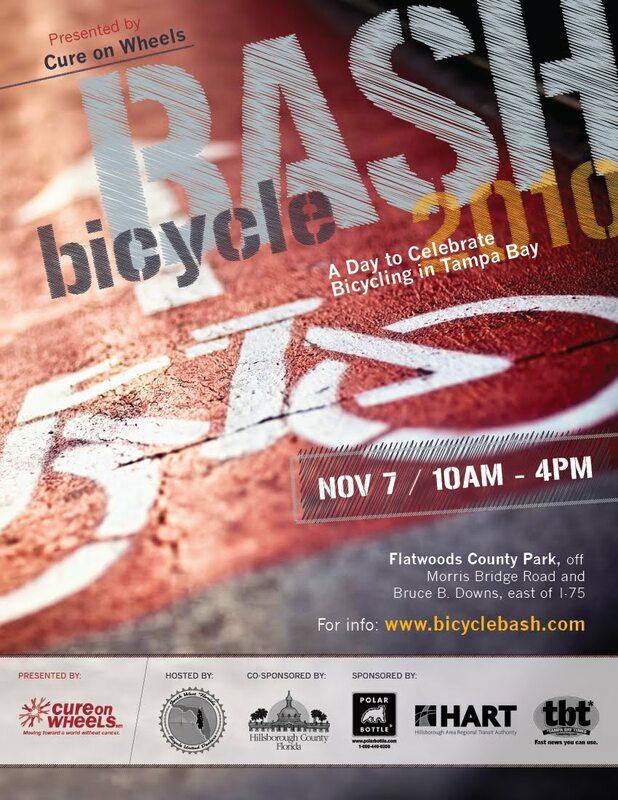 Mayor Iorio, start making Tampa safe for bicyclists. Ed was interviewed by Bay News 0 reporter Jody Lowery. Ed, an accomplished cyclist, still has not been able to hop on his bicycle after his dad was killed while riding a bike. SWFBUD store owners Randy Myhre (L) of Oliver's Cycle Sports and Brian Eckman of Carrollwood Bicycle Emporium stand by the ghost bike today. SWFBUD has called on the city of Tampa to launch a bicyclist safety campaign, complete with Mayor Iorio issuing pro-bicycle statements on PSAs, a billboard campaign and using all platforms to advise motorists to watch for bicyclists. They do things differently in Brooklyn. Check out this story about a crazy anti-bicycle dude using Krazy Glue on bike locks in Brooklyn. The anti-bike vigilante doesn't like all the bikes locked up on a local Brooklyn sidewalk. One day after Yahoo posted a story about the LA mayor becoming a bicycle advocate after he was struck by a cab, Yahoo runs another bicycle story today. This time, it's the case of the Floyd Landis mountain bike that ended up on the side of a highway and sold for five bucks at a yard sale. I posted a photo of this Ghost Bike Sunday. 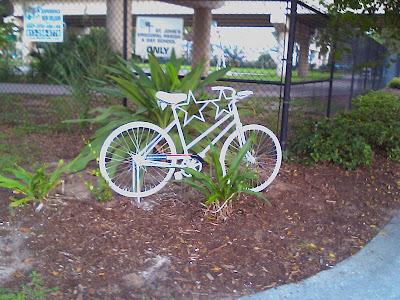 The photo was sent to me by the maker of the Ghost Bike, which memorializes the life of retired Admiral LeRoy Collins of Davis Islands, killed while riding a bicycle along South Hyde Park Avenue at the Brorein Street corner shortly after 6 AM July 29. The person who fashioned the Ghost Bike has requested anonymity and I will comply with that request. The Ghost Bike was put into place Sunday. This afternoon I bicycled to see the Ghost Bike in person. It left a big impact. To see it in person drives home the fact that being a bicyclist in this area means you have to be on high alert when cycling at all times. For me, it means cycling with my hands on the brake hoods and scanning every side street, every vehicle and every corner. I also pedal with the notion of being ready in a heartbeat to spring into action to avoid being struck by a car. My bike-commuting in New York City prepared me well for the unpredictable and aggressive nature of Tampa Bay's drivers. I didn't know Mr. Collins. 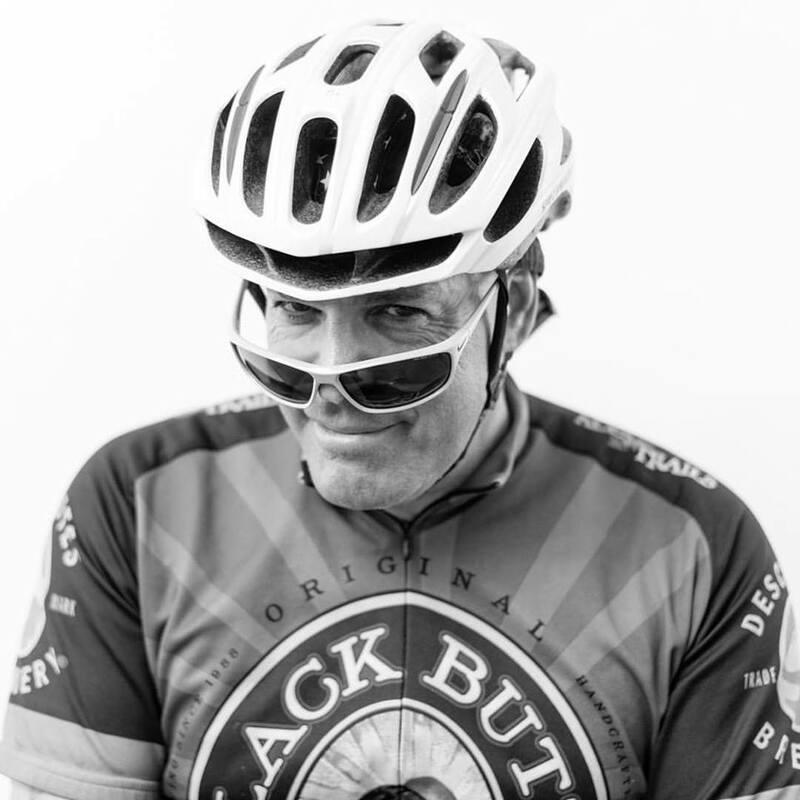 But I am friends with his bicyclist son, Ed, an experienced cyclist who is still hurting. Ed appeared before a Tampa City Council meeting recently to advise the city to take action to make our streets safer. Ed told me today that he still hasn't been emotionally ready to get on his bicycle since the day his dad was killed while riding a bike. The person who fashioned the Ghost Bike did a remarkable job at creating a moving and beautiful memorial. For example, there are 14 stars on the chainguard. The 14 represent Mr. Collins, his wife, their four children and eight grandchildren. At the request of the Ghost Bike maker, I wove the jasmine plant vines into the front wheel spokes this afternoon. The top tube is two stars -- Mr. Collins was a two-star admiral. If you notice, the Ghost Bike is very close to the Selmon Expressway. Wouldn't it be great to have a bike trail below the toll expressway. There are plans to accomplish that -- check out the Selmon Expressway Greenway Trail proposal on Wednesday from 4-6:30 PM at Union Station. Bottom line -- please drive your bicycle like the vehicle it is. The mayor of Los Angeles has seen the light about bicycling after he was struck by a cab while riding a bicycle. 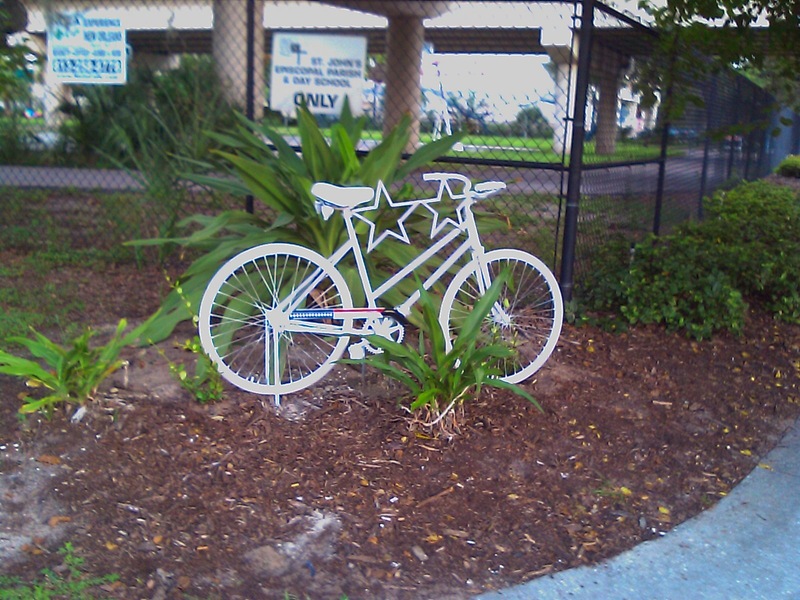 A ghost bicycle memorializes the life of bicyclist LeRoy Collins, II -- killed by a motorist July 29 in Tampa. It was mighty hot out there early this morning but cyclists in three cities -- Tampa, St. Pete and Clearwater -- set out at 8 am for the Independence from Oil/Bicycle Safety rides. Margaret Shepherd of the Seminole Heights Bicycle Club did a nice job leading a ride from Curtis Hixon Park in downtown Tampa over the Gandy Bridge and back. "We had 25 people start - rode to Ballast Point Park and 6 or so folks headed back to Curtis Hixon Park with Karen Kress leading and Jim Shirk doing sweep duty. We had about 20 folks head out to cross the Gandy. "All went well and as we crested the hump on the eastbound Gandy we had a fun surprise -- Jose and the St Pete group were waiting at the top to greet us!!! How Fun! "I must confess, during a good part of the ride (from Gandy Bl, across & back and back up Bayshore, I pretty much 'led from behind' cuz most of the riders were, okay I'll say it: younger and stronger!) But everybody seemed to have a good time with no incidents of consequence. Before I left Curtis Hixon Park at the end, I walked through the misting fountain - WOW! WHAT A TREAT after a hot ride!!! Ya gotta do that when you get a chance!!! Thanks Jose for getting us all out there! Thanks Karen for bringing out helmets and guiding folks back safely. Thanks Jim for being sure everyone was in. and Thanks to Wayne Somebody who did sweep for the long ride"
It's hardly a new story, but it's always fun to see Rays Manager Joe Maddon riding his bicycle. A baseball preview show that aired before today's Rays-Orioles game on the local FOX_TV station had a fun report about how Maddon likes to ride his foldable bicycle. 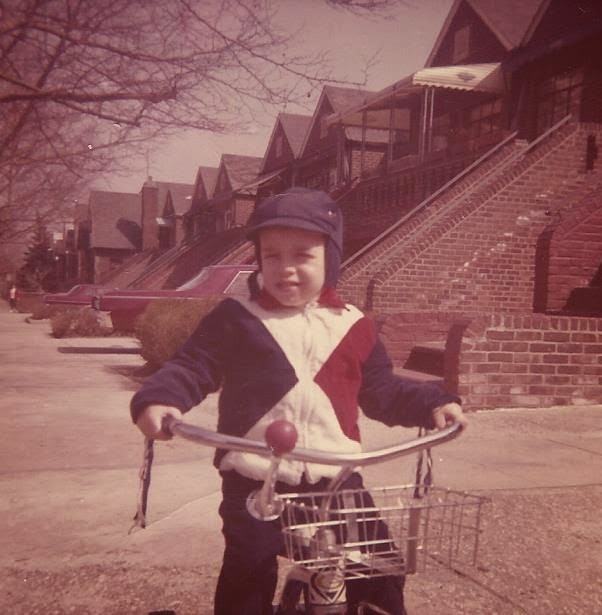 I heard along the grapevine that Tampa Mayor Pam Iorio doesn't think a lot of people bike in Tampa, but maybe that was the Tampa decades ago when she grew up in the city. Not anymore. Several Tampa bicycle organizations have cropped up in the past few years and here's the most compelling data of all -- Tampa was 17th out of 70 big cities in the U.S. when it comes to bike commuting in 2008. 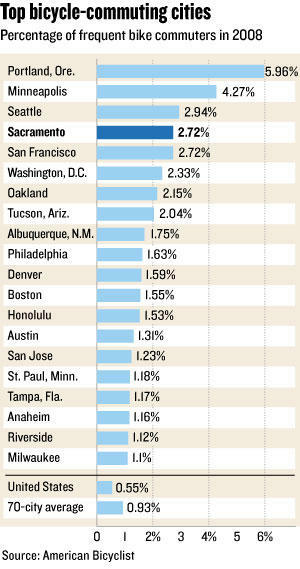 Check out this chart; American Bicyclist is the source. 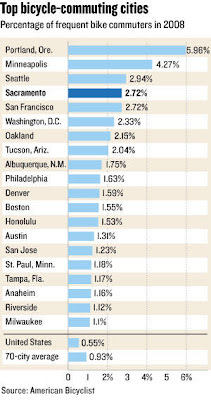 If you notice, Tampa finished just behind bike cities like Austin, 14th (home to Lance Armstrong); San Jose, 15th (California Bay area city); and St. Paul, Minn. 16th (Twin city to Minneapolis, which was number 2 in the country). People DO ride bicycles in Tampa -- and many more would if Tampa improved bicycle infrastructure.